On August 25th, Antonio Solano Vazquez, one of the alleged perpetrators of the ambush where human rights defenders Bety Cariño Trujillo, director of the Community Working Together Support Center at (CACTUS in its Spanish acronym) and Jyri Antero Jaakkola , a human rights observer of Finnish origin, were killed in April 2010 while participating in a humanitarian caravan in San Juan Copala, Oaxaca, was arrested in Sinaloa. For seven years, relatives, social and human rights organizations as well as Euro-parliamentarians have questioned the Mexican government and Oaxaca’s lack of progress in the delivery of justice. With this arrest, six people have been arrested and seven arrest warrants are still pending. Both legislators stressed that in all their visits, they have heard promises from various public officials both in Oaxaca and at the federal level but that they are still not being implemented. “The new governor of Oaxaca [Alejandro Murat, who received them in a private meeting] assured us that he will solve the murder and do justice, but what we want is to see how that commitment translates into concrete actions. The commitment is very important, but we do not know how they will show it with deeds“, said Ska Keller in an interview with La Jornada. They recalled that of the alleged perpetrators of the murder, one is already dead, eight are released and five are in prison without sentence; two of the key witnesses who were present at the events were threatened; the lawyer of the accused is also the interpreter of the families of the victims; and the case is based in Huajuapan in the same Triqui region, so it is unsafe for witnesses. During an official visit from the deputies from the European Parliament who have been following the case of the murders of Bety Cariño and Jyri Jaakkola, which took place in April 2010 on a humanitarian caravan en route to the Triqui region, no representative of the government of Gabino Cué Monteagudo or even the commissioner for human rights, Eréndira Cruz Villegas, received the Eurodeputies Satu Hassi and Ska Keller. The member of the Finnish Parliament, Satu Hassi, clarified that they had decided to come to Oaxaca “because there have been no advances; there is nothing; nothing has happened. For this reason, my conclusion is that there is a total lack of will” to arrest the perpetrators of these crimes. She stressed that they held meetings with the federal government but not with the Oaxacan state government, as the latter indicated that it was not the right time. Hassi mentioned that although there are accords written and signed between Omar Esparza, the widower of Bety Cariño, the Finnish embassy, and the European Union, as well as between lawyers of the families of the activists and the Oaxacan state authorities, nothing has happened, such that there is no other explanation than lack of interest. 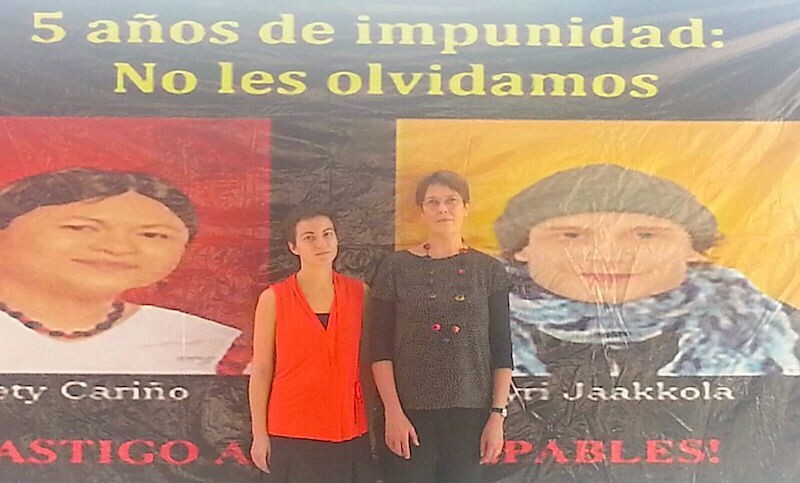 She added that “we see a very similar pattern between the case of Jyri Jaakkola and Bety Cariño and that of the 43 disappeared from Ayotzinapa, because there are large gaps in time before investigations are launched, and the authorities hide evidence or even deliberately destroy it.” She concluded that the cases of the 43 and that of Bety and Jyri are symptoms of the same disease—impunity—such that it is not judicial officials but others who document evidence. You are currently browsing the archives for the Finland category.